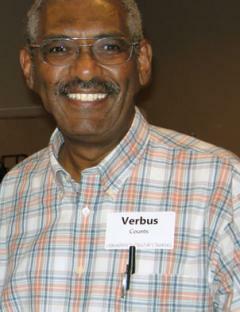 Verbus Counts has over 45 years experience in Information Technology including database administration, computer programming and instruction and project management. His experience has included government organizations including the military, Federal Aviation Administration, Internal Revenue Service and Medicaid Management Information Systems (MMIS). In the areas of website and database development Mr. Counts has used a large array of technologies including Python, Ruby, Sybase, MySQL, Informix, Oracle, Ingres, PostgeSQL, and Redis. Mr. Counts coordinated the use of XML as a standard methodology for information exchange with HP partners such as SAP to eliminate redundant collection of client data. He also developed a wed based reporting system for server response for business transactions and developed a website to report performance. He was responsible for replication and backup, and as hands-on DBA Manager for corporate databases. Mr. Counts managed projects for Medicaid Management Information Systems for Tennessee, District of Columbia, Texas, California, and New Hampshire. Mr. Counts founded three organizations in software technology: Palmetto Open Source Software Conference (http://www.posscon.org/), Open Source University and EMR Technical Solutions, LLC. He is also a member of Advisory Board for The Integrated Information Technology Program at the University of South Carolina.